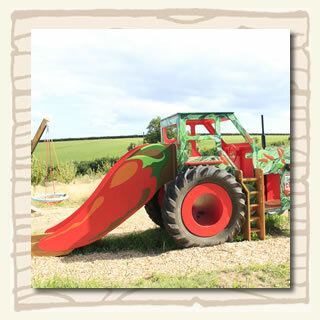 We find kids love chillies, especially when they are in the form of a super chilli tractor that you can scramble over and slide down. 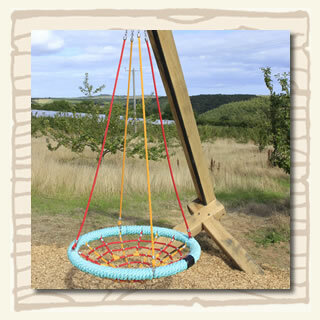 Our play area also has a twisty basket swing and kids can race around our orchard paths if they need to burn off more energy. We have activity sheets with quizzes, stamps and colouring sheets and lots of stickers to give away as a memento of their visit. If the weather is bad we have some undercover activity sheets as well as a dressing up bag - great for a photo to take home. We like to encourage a passion for chillies from an early age and we are often surprised by how much some youngsters really take to the heat of the chilli and many older kids are fascinated by the Scoville heat scale and can't resist the challenge to try our hottest sauces and chocolates! A sticker for anyone up to the challenge. During the Easter holidays and in the October Half Term holiday, we have extra activities for children with an Easter and Halloween theme.